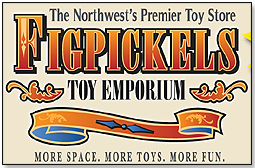 Figpickels Toy Emporium in Coeur D'Alene, Idaho, founded in 2005 and run by Brett and Susan Sommer; and Children's World in Sarasota, Fla., founded in 1965 and run by Tim and Cynthia Holliday. Both of these stores are uniquely positioned to gain from the generosity of the donors and turn their lucky chance into events that capture their local media's attention, strengthen their place in their community, and help scores of needy children by giving them amazing, high-quality specialty toys for the holidays. "The timing of this giveaway would really be perfect for helping our store launch our holiday tree this year (themed ‘adopt a classroom and change the world'). Teachers and students will work together to create a wish list to hang on the tree and our community will have the opportunity to help make their wishes come true. "We will immediately start supporting this giveaway through press releases, our blog page (will announce on our blog that we've applied for this promotion), QVR's linking to this program and the participating manufacturers, YouTube, social media (we have a reach of 2,500), and in-store promotions. We would love to make announcements during our Neighborhood Toy Store Day Event on November 10th, which will have regional coverage, as this is the day we are kicking off our Toys For Tots Drive and introducing the winners of our Board of Directors Essay Contest, and celebrating our 7th year in business! How great would it be to have the additional support of the toy manufacturing community? "Our Board of Directors consists of 12 kids, aged 5 through 12, who were among the hundreds of kids who entered our essay contest. They will have a secret toy-testing day where they will choose the best specialty toys for the holidays. We'll compose a list based on their recommendations. "We have scheduled a 2 hour live in-store broadcast through our ABC affiliate on December 5th. This event gives us 2 straight hours of coverage and would be a great time for us to announce the beneficiaries of your give away." We can hardly wait for the amazing photos we're sure will come from Brett and Susan's many scheduled events! In addition to running a toy store, Tim also sells uniforms to 30 schools in his community and has an in-store U.S. post office that attracts foot traffic through the store – and right past pertinent displays – including one he's planning of samples from each of the donating manufacturers. "We are hugely into supporting our local community, and because of that, we were recently named the 2012 National Runner-up for the Independent Small Business of the Year. Support of the local community was pretty much the major factor in determining the six finalists, with public vote determining the final ranking. Also, being a specialty toy (and uniform) store, we fully support specialty manufacturers, and would be happy to spread their product to our local schools and charities. "I am a marketing nut, and have great relationships with the local media outlets, which is why we get the coverage and support for our events that we do. In addition, by recently being named the 2012 National Runner-up for the Independent Small Business of the Year, we have gotten top-shelf coverage from all of the local, and regional TV, radio, newspapers and more. The coverage is still happening. Just yesterday, we made it on the regional CBS website, and today, we had a visit from our U.S. Congressman, and were awarded a Certificate of Special Congressional Recognition. Next week, the local newspaper is doing a story on us as well. So we are certainly in a unique position right now, because of all of that, and we could certainly leverage that to promote this big donation in our community in a way that really, no one else could do. "In short, we have had a phenomenal year, and about the only thing that could finish the year out with a bang for us after being named 2012 National Runner-up for the Independent Small Business of the Year would be to win this contest and be able to spread some amazing joy through the gifts of partnering with you and the specialty manufacturers to give away a bunch of toys. We would be honored to do so, and helping others in a big way would be a fitting end to our amazing year." In celebration of our tenth anniversary, Moonjar has created a brand new Moneybox with a global twist. Each metallic section is wrapped in the words, "Save, Spend and Share" in languages from around the world. The boxes are gold, silver and copper colors to appeal to the tween set as well as their parents. Little rock star swill take center stage playing Schoenhut's “next generation” guitar. Schoenhut's innovative design incorporating a molded composite body with dual curves greatly enhances sound and durability. The birch soundboard which offers excellent tone and resonance, hardwood neck (for rigidity), and molded composite fretboard ensure proper height and spacing of the frets. Six steel strings permit a wide range of rich sounds. Available in several vibrant designs. Includes: Pick and Extra String. This "to-go" box is one of our Conversation to Go options – there are three total. This box is filled with 100 unique conversation starters about Vacation and travel. It’s not about where you have been, it’s about where you are going with this conversation game. It will bring you to places you never dreamed of. Twinkle Tunes features a 1-octave (8-note) keyboard that electronically produces lovely piano sounds, enhanced with a beautifully illustrated interchangeable songbook containing a collection of 12 familiar tunes. This instrument, designed for the child who has no previous piano study, is paired with Schoenhut’s patented Tri-Play Learning System. 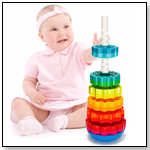 Easily portable for young children, this unique toy provides hours of musical fun. Battery included. Additional books sold separately. Schoenhut's Thumb Pianos are sure to be a hit with the young set. These percussion instruments, also known as Marimbas, emit warm, resonant tones by striking the ends of the tines with your thumbs. Simple tunes are easily tapped out, with unlimited possibilities for creating complex melodies. The new design incorporates a durable molded composite back, resulting in enhanced sound and durability. Easily portable and fun to play, a Schoenhut Thumb Piano is the perfect choice for encouraging children to enjoy music. Available in several vibrant designs. 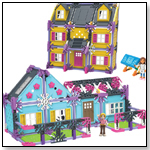 · Let the Giveaways Begin: 1,025 Specialty Toys Go to School! · FINAL GIVEAWAY CONTEST FOR 2012!